Egg: 4-5 eggs laid per female each day in cracks and crevices on, in or near bedding. Will only hatch above 13°C. Nymph: Nymphs reach adulthood within 5 moults after several weeks under optimum conditions. Adult: Adults are 6mm and their lifespan is dictated primarily by the abundance of food and the ambient temperature, with some individuals having been noted to last almost 12 months without feeding, surviving in a state of diapause. 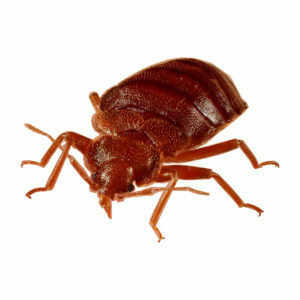 The bed-bug is a wingless ectoparasite with an oval body. The body is flattened unless it has taken a blood feed, after which the abdomen will be distended as it taken on a blood meal up to 7 times its own bodyweight. Colour ranges from brown to mahogany depending on when the last blood meal was taken. The bed-bug inhabits houses worldwide. More commonly associated with hotels and hostel accommodation where the adults infest cracks, crevices, furniture and bedding. Bed-bugs will usually feed at night while the host is sleeping, bite marks visible on body parts exposed to bedding or furniture. Bed-bug harbourages produce a distinct musty smell which is an accumulation of faeces and scenting. 1. The British Pest Management Manual. Section 5, pg 76.